Today was the big one. The highest pass we did, 11,925'. Very steep and rocky at the top. Had to push a lot. Then a long decent down the Frying Pan river to Basalt and on to Carbondale. Of course we saved the highest pass, and the longest ride, for the last day. From the lake it was easy railroad grade for a few miles with great views of the mountains. Then the road went to hell and it got steep and rocky. At one point I just sat down at the side of the road, and to my delight there were a bunch of wild raspberries. I just sat there and feasted for a while. When we got near the top the road turned to sand. At this point all I could do was push. It did flatten out just enough to get back on the bike and ride to the summit. What a rush to have ridden up to just shy of 12,000'. The road down was very rocky for the first few miles and we had to go slow and get off a lot. It gradually got better and we picked up speed for the long decent into the Frying Pan river valley. I didn't get any pictures but the Frying Pan runs through a red rock canyon with enough green trees to make it really spectacular. It comes out a Basalt where it joins the Roaring Fork. We stopped in Basalt for a quick snack. 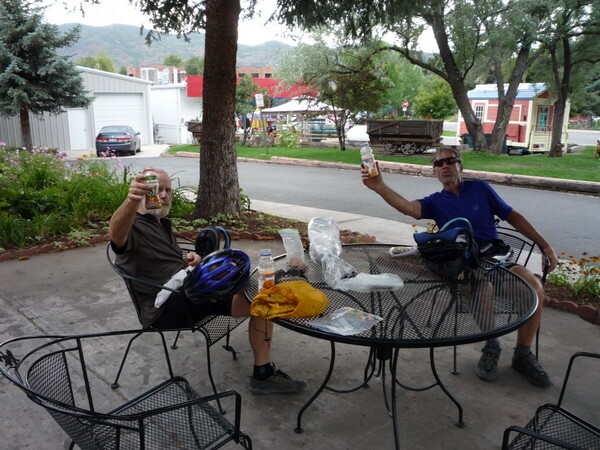 From there we got on the Rio Grande bike path for the last 12 miles to Carbondale. Then came the final grunt up the hill to Sharon's house. 345 miles back to where we started. So that was it. My first big self supported tour. Our first bikepacking trip, well before it was called bikepacking. We crossed the continental divide twice, on rugged dirt roads, had an amazing adventure, saw no bears, and had a great taste of Colorado. I was hooked. 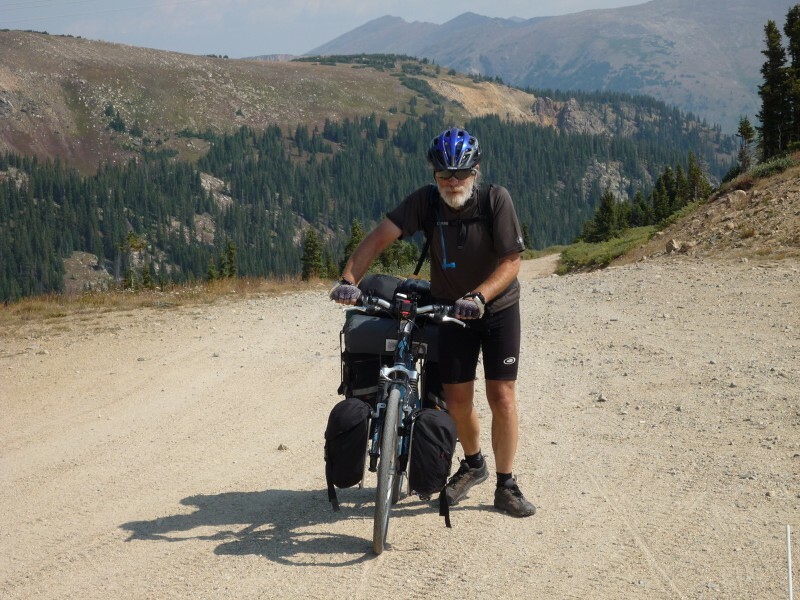 Spectacular mountain views on the climb to Hagerman pass. Looking back down to Turquoise Lake and the road we had just climbed. The going got really rough for a while. Defeated by a mountain. I could not make any headway in the sand. Fortunately it let up enough fop me to get back on and ride to the summit. The closest we got to snow was above 1200'. The road down was not looking much better than the one we just climbed. We had to keep the speed down for a few miles until it gradually started getting better. And then we were done. Back to civilization for a refresing break, before the last few miles back to Sharon's house.